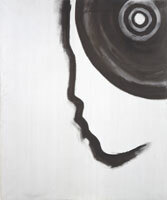 "Talking in Black" at the Museum of Cultural Heritage. 21 paintings, all the same height, all in black and white. Country, Man, Soul. Three spheres as one - Unity in Diversity, a truth of Ukraine. A Country is an imaginary state that forms humanity. A Country lives inside heart and mind. It relies on understanding and the strength to accept others. A Country is a river with thousands of streams flowing together. A Country is a source of energy for all those who are part of it – an energy that, when respected and loved, inspires the best in people. In Man, it is what is hidden that is most important. Often, a person cannot bear to look inside themselves as they fear seeing ugliness. So they look outside to release pent up frustration. To be among people is painful, each pain inside one person presses on the pain of another, with explosive results. People always have a reason for their actions – however they are not always good reasons. When faced with this pain, we seek short term relief which often causes long term destruction. Each of us needs to resolve our own problems. To be with others requires courage, to love them requires soul. Soul is another dimension, it encompasses everything. A Soul is a state that forms reality. Here there are no limits, the only thing that gets in the way are the preconceptions of the human mind. It is the ethics of what is true. It is a place that is universal and personal - the everything interacting with the one. The soul is the beauty within and without. The older we get, the more strongly our soul shows. Real Art doesn’t shy away from problems. Art creates Beauty that is the result of a successful search for sense. Talking in Black results in Beauty – a uniquely Ukrainian Beauty.